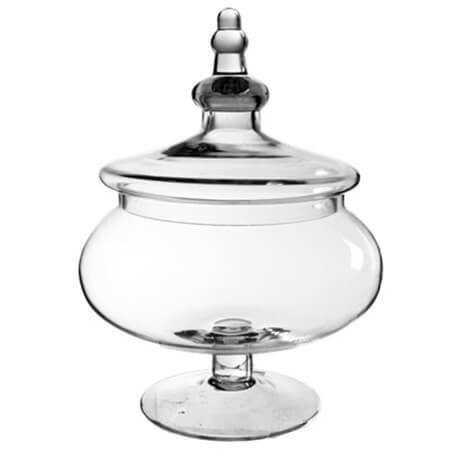 This 16.5"Apothecary Candy Jar is a highly versatile container that can be shown off in a wide range of locations. Your home can shine from the pantry to the kitchen, dining room or living rooms to hold snacks and decorative touches. Set up in your candy store on shelves as a nostalgic way to display your candies where customers can easily view each and every flavor and piece as well as help themselves with scoops. Where the fun really seems to come in is for anyone planning weddings and other such events. 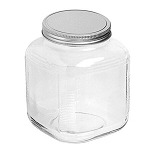 Centerpieces in a wide range from stylish elegance to fun and funky and all that goes in between, this glass jar is the perfect glass piece for that very set up. Each of these decor pieces is great for candy buffets of any size as well. Capture the attention by the contents you choose since the clear glass sides will exhibit each and every piece you place inside. Even floral displays can be a masterpiece from top to bottom, show off the bottom of stems with stones and other such decorative materials. Order yours today! *No replacements for damaged shipments, only refund of item purchase price only. Shipping charges are non-refundable.